The picture you see at right is some kind of ape. It was seen running loose through the Florida Everglades in 2006 and successfully evaded capture. Distribution of the pics inspired some to anoint them as photographic evidence of Florida’s premium cryptid, the Skunk Ape. 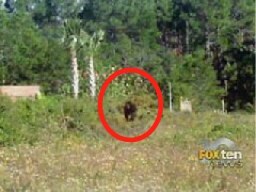 A version of Bigfoot alleged to live in the swamps which dominate the southern, tropical wetlands of the Sunshine State. But allow me to posit another theory. There is monkey kingdom in a swamp that also contains alligators, panthers and snakes so large they sometimes burst because they’ve attempted to eat an alligator. Also, Chris Cooper from Adaptation. My question to the Weird Things readership, which is a cooler idea? A genuine cryptid albeit a lonely one OR an ecosystem of swamp monkeys that have learned to live amongst the rest of the Everglades buck wild natives. You are currently browsing the archives for the Skunk Ape category.